Thinking about setting up a new laboratory for testing? We’ve made it easy for you with this basic list of the things needed to complete your laboratory requirements. AWS has all the chemistry you need for successful wine testing! AWS makes it convenient to get your laboratory on its way with these starter kits. Purchase Ebulliometer and replacement thermometer and wicks. AWS items filtration thru goggles. 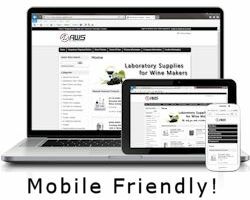 AWS offers all the pH tools you need to make wine testing a success! AWS has all the pipets and accessories you will need.